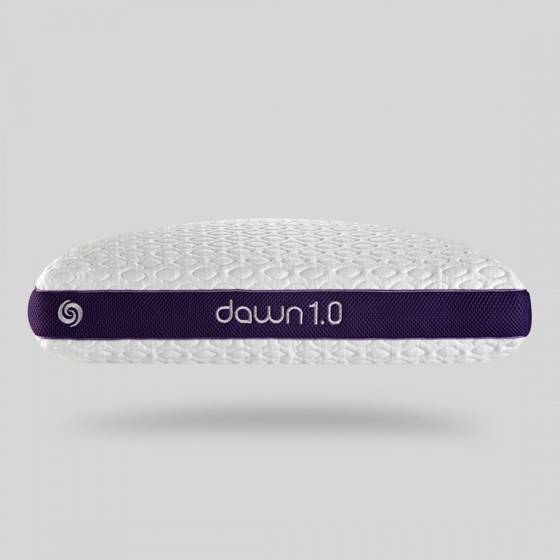 The Dawn 1.0 Performance Pillow is SLEEP TESTED for stomach sleepers or small body types. Dawn’s flexible foundation and personal performance size allows you to comfortably sleep with your arm beneath your pillow. The unique dual chamber construction of the Circadian Series features a Boost® foam crown and Boost foam blend which ensures weightless pressure relief that won’t bottom out, creating the perfect pillow for soft support with no rebound. The Ver-Tex® 6.0 climate control fabric provides a cool to touch feeling and continuous heat deflection, regulating your body temperature for a cooler nights rest. The Air-X® ventilated panels increase airflow and feature a filter fabric which prevents allergens and dander from entering the pillow core. Crown: A proprietary blend of latex and smooth microfibers, the Boost foam crown ensures weightless pressure relief that won’t bottom out, creating the perfect pillow for soft support with no rebound. Blend: A proprietary blend of latex and our custom silk-feel fibers, our Boost foam blend provides a soft and breathable fill that conforms to any shape. Pressure-free support adapts to you, delivering motion performance that eliminates pillow bounce and helps ensure deep sleep.